An all-in-one black and red long sleeved shrug bolero top. 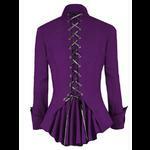 The black shrug ties under the bust and the sleeves have a slight flare at the cuffs. Bust: 36" unstretched Length: 23"
Bust: 38" unstretched Length: 23"